A note about this recipe – for the first time I used peanut flour. I did combination of two cups peanut flour and one cup almond. I found the flour at Trader Joe’s. The only ingredient is roasted peanuts. For people in the beginning stages of the diet, or still having symptoms, the peanut flour probably wouldn’t be a great idea. The peanut flour was very different than almond flour. It was very fine, almost a little powdery like cocoa. When it gets wet it turns into peanut butter kind of. The texture of my cake was much more like one baked with regular flour. 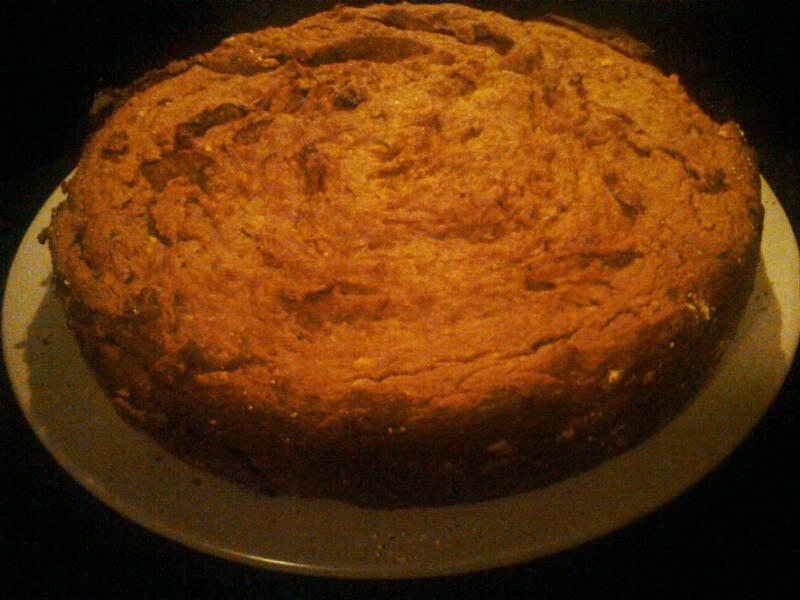 Not a light cake, but more like banana bread or a spice cake. In large bowl sift flour, stir in the rest of the dry ingredients. In a separate bowl mix the rest of the ingredients except for the walnuts. Mix the wet ingredients until well blended and smooth. Add to the dry ingredients and stir well. Fold in the walnuts. Pour the batter into a 9 inch round pan or a 9×13 inch cake pan for a thinner cake. I used a little oil and some of the peanut flour to prepare the cake pan. Note: I adjusted this recipe on 12/26 after trying it again. I originally had 3 cups flour before sifting, but I thought it worked better using 2 cups of flour before sifting.